This humidity's really getting to me. I'm guessing I acclimated to the desert dry conditions in the Midwest because I've been feeling all sorts of uncomfortable since I got back. Anyway, a friend of mine has been wanting to introduce me to a fabulous little spot in the far West Village and he finally got his chance last night. Left Bank opened late last summer and has managed to stay low-key--unlike many of the other restaurants in this neighborhood. 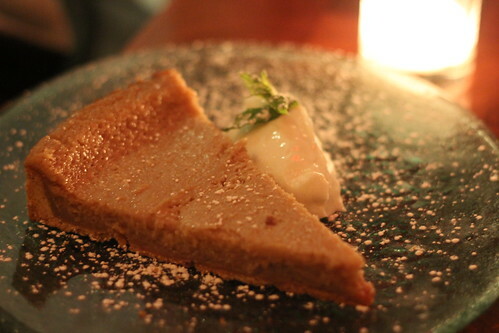 The menu changes with the seasons and what's available at the farmers market, but one constant is the maple sugar pie. One of the owners, Micheline Gaulin, supplied her family's recipe for this Quebecois treat. The thick crust crumbles perfectly and doesn't overwhelm the maple custard goodness it holds. You don't even need the lemon whipped cream that comes with it.